This article is about live action television series. For other television series, see Sabrina the Teenage Witch (disambiguation). Sabrina the Teenage Witch is an American sitcom based on the Archie Comics series of the same name. The show premiered on September 27, 1996, on ABC to over 17 million viewers in its "T.G.I.F." line-up. The show stars Melissa Joan Hart as Sabrina Spellman, an American teenager who, on her sixteenth birthday, discovers she has magical powers (a departure from the Archie Comics, where she has known of her magic powers since an early age as revealed in the "Sabrina – That Cute Little Witch" storylines in many Little Archie comic books). She lives with her 500-year-old aunts, witches Hilda (played by Caroline Rhea) and Zelda (played by Beth Broderick), and their magical talking cat, Salem (voiced by Nick Bakay), at 133 Collins Road, in the fictional Boston suburb of Westbridge, Massachusetts through most of the series. The series' first four seasons aired on ABC from September 27, 1996, to May 5, 2000; the final three seasons ran on The WB from September 22, 2000, to April 24, 2003. The unofficial pilot of the series was the 1996 TV movie Sabrina the Teenage Witch in April. The movie, produced by Viacom and Hartbreak Films and aired on Showtime, starred Melissa Joan Hart as the title character, Sabrina Sawyer, and Charlene Fernetz and Sherry Miller as Sabrina's aunts Zelda and Hilda, respectively. When the television series debuted on ABC later that year, Hart became Sabrina Spellman, and Caroline Rhea and Beth Broderick replaced Fernetz and Miller. In 2000, the show was dropped by ABC and picked up by The WB. When viewership began to wane, the show was canceled after seven seasons. The television series was produced by Hartbreak Films and Viacom Productions with Finishing the Hat Productions being there for season 1 only. Later it was syndicated through Paramount Domestic Television on reruns. Paramount Network Television absorbed Viacom Productions in 2004, and two years later, Paramount's TV operations were renamed to CBS Paramount Television (now CBS Television Studios), whose name is seen on the season 1, 2, and 3 DVDs. Then in 2007, the syndication arm was renamed from CBS Paramount Domestic Television to CBS Television Distribution, whose name is on the season 4, 5, 6, and 7 DVDs. The official copyright holder for the series (as with all series originally produced by Viacom Productions) is CBS Studios Productions, LLC. The opening titles of the first three seasons shows Sabrina in front of a mirror posing with four different costumes and outfits as the cast members' names quickly flash on the bottom of the screen. The first three outfits are always the same, but the fourth one changes from episode to episode. At the end, Sabrina would say something that is related to the last costume (often a pun or a joke related to the costume or the content of the episode), and then magically disappear from head on down. The opening sequence for the fourth season is completely redone, featuring a completely new theme and the show's main characters, starting with Sabrina, floating in bubbles while their names are displayed in gold letters and a voice chants "Secret" in the background. The opening credits for the final three seasons are accompanied by a new vocal theme song and feature Sabrina at various locations around Boston: Harvard Bridge, Boston Common, Union Oyster House, Massachusetts State House, Quincy Market, Newbury Street, Harvard University, Tufts University, and Beacon Hill. In the credits of seasons five and six, after leaving Newbury Comics on Newbury Street, Sabrina walks down a flight of stairs and computer graphics morph Sabrina into her room, lying on her bed next to Salem. In the final season, however, the computer graphics morph Sabrina arriving at Scorch. Upon pushing the door open, she is revealed to be walking into her house to greet Roxie, Morgan, and Salem. The actual house photographed and filmed to depict Spellman Manor is a Victorian mansion located at 64 E. Main St. in Freehold, New Jersey. The exteriors for Westbridge High School, which Sabrina attended, were Dwight Morrow High School in Englewood, New Jersey. The show went through many cast changes, the first major change being the unexplained departure of Sabrina's best friend Jenny Kelly (Michelle Beaudoin) at the end of the first season. At the beginning of the fourth season, Valerie departs the show permanently along with Libby. Valerie's character moves away to Alaska with her family, while Libby transfers to a boarding school. When the series finished its fourth season, several secondary characters left the show, including Martin Mull and Nate Richert. Richert, who played Sabrina's boyfriend Harvey since the first season, was cut in order to give the show a more "grown-up look" as Sabrina was about to attend college. The decision was later rescinded, and Richert appeared in three episodes of season five and then returned as a series regular in season six and seven. After the series' sixth season, Caroline Rhea and Beth Broderick, who portrayed Sabrina's aunts from the show's premiere, decided to leave the show. When the character of Sabrina started to attend college, the role of her aunts became less important. Broderick felt that the role of Zelda had nothing more to offer, while Rhea landed her own syndicated talk show, The Caroline Rhea Show. Trevor Lissauer, who played Sabrina's housemate Miles, left the show after appearing in seasons five and six. Producers felt that his character wasn't well received by fans and also had to make some budget cuts for the show's seventh and final season. Miles was never properly written out, leaving open what really happened to him. Sabrina's love interest Josh, played by David Lascher, left for Prague after appearing from season four to six. Lascher reportedly wanted to pursue other projects. In order to fill the void, producers brought in Aaron, played by Dylan Neal, as Sabrina's love interest in the show's final season. The show chronicles the adventures of Sabrina Spellman (played by Melissa Joan Hart), a girl who discovers on her sixteenth birthday that she is a witch. As a novice witch, her spells often go awry. Her aunts Hilda and Zelda Spellman (played by Caroline Rhea and Beth Broderick, respectively, until 2002) counsel her on the proper use of her magic and give her moral advice. Additionally, Hilda and Zelda must take care of Salem Saberhagen (voiced by Nick Bakay), a witch, turned into a cat for trying to take over the world. Sabrina's basic premise and "genial loopiness" earned the show comparisons to the 1960s television series Bewitched. The show included contemporary pop cultural references, with Sabrina often saying she liked Britney Spears and No Doubt. It also mentioned human history alongside witches, such as the Salem witch hunt, which Zelda tells Sabrina was not a hunt for real witches. Hilda mentions to Sabrina in Episode 1 that "For two months a bunny ruled all of England" causing the witches council to turn back time, as if to say mortals are ignorant at the most. One episode also suggests that Jerry Springer is a witch when he hosts The Jerry Springer Show in the other realm. Whereas the comic book series was set in the fictional Greendale, the TV show was set in the fictional Boston suburb of Westbridge, Massachusetts. The pilot episode opens with Sabrina asleep on her 16th birthday, levitating above her bed. In the morning, her aunts reveal to her that she is a witch, but Sabrina does not believe them until she has a magical talk with her father from inside a book, where her father reveals that he is a witch and her mother is mortal. It is also revealed that Sabrina cannot see her mother, who is in Peru for two years, or her mother will be transformed into a ball of wax. After a rough day at school, Sabrina accidentally turns Libby Chesler, the most popular girl in school, into a pineapple. Fearing that she will appear "weird" to her crush, Harvey Kinkle, Sabrina asks the Witches Council to let her relive that day. 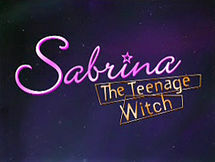 The first season follows Sabrina as she tries to keep the balance between being a teenager and having magical powers. Sabrina's friend Jenny Kelley and her teacher, Mr. Pool, both exit the series without explanation after this season. At the beginning of the second season, Sabrina turns seventeen and learns that she must earn her witch's license or otherwise lose her magic. However, she neglects her aunts' warnings to study for the test to obtain the license and consequently fails it. She then has to attend witch boot camp to earn the chance to take a makeup test. She passes the makeup test, but only receives a learner's permit. Her aunts explain that she will be able to earn her license when she turns eighteen ("when she can pay for the insurance") and that she will be tested throughout the year by a Quizmaster, a witch whose job is to instruct witches earning their licenses. Also introduced during the second season are Sabrina's neurotic friend Valerie and the new school vice principal Mr. Kraft, who finds Sabrina to be very odd and has a crush on Hilda. At the beginning of the third season, Sabrina earns her license, but then learns that in order to use her license, she must solve her family's secret. Throughout the season, family members visit her and provide clues. At the end of the season, she solves the family secret ("Every member of the Spellman family is born with a twin"). Both Valerie and Libby exit the series after the end of the third season. At the beginning of the fourth season, Sabrina is assigned to be a mentor, which is like a Quizmaster, except "Quizmasters get paid". Sabrina's charge is Dreama, a witch newly immigrated from the Other Realm. A new student, Brad Alcero, who is also Harvey’s best friend, transfers to Sabrina's school. Because Brad has a witch-hunter gene (which allows him to turn a witch into a mouse if the witch reveals his/her magic), Sabrina must keep herself and Dreama from using magic in front of Brad. Also, Sabrina begins working at Bean There, Brewed That, a coffee shop, where she meets and is attracted to Josh (played by David Lascher), a college student who is the manager of the shop, which leads to her kissing him and thus cheating on Harvey, who ends their relationship, but they soon get back together. Both Dreama and Brad are written out of the series without explanation over the course of the season. At the end of the season, Harvey reaches his "spell quota" (meaning that no spells can be used on him anymore) and discovers that Sabrina is a witch, and later breaks up with Sabrina off screen and is written out of the show prior to the start of the next season. At the beginning of the fifth season, Sabrina starts college at Adams College and moves out of her aunts' house and into a house with other students at Adams. Her roommates are Morgan Cavanaugh, a shallow girl (played by Elisa Donovan); Roxie King (played by Soleil Moon Frye), a social feminist; and Miles Goodman (played by Trevor Lissauer), a geek who is obsessed with science fiction and the paranormal. Hilda and Zelda, feeling lonely since Sabrina moved out, find ways to stay close to her. Hilda buys the coffee shop where Sabrina works and Zelda becomes a professor at Adams and starts dating Sabrina's English professor. The season ends with Sabrina and Josh giving into their feelings and sharing a passionate kiss. At the beginning of the sixth season Josh and Sabrina get together but soon face a tough decision when Josh is tempted to move abroad to work as a photographer. Things are made even more complicated between them when Sabrina's ex-boyfriend from high school, Harvey, reappears, this time dating Sabrina's roommate Morgan. At the end of the sixth season, Sabrina agrees to sacrifice true love in order to save Hilda after the latter literally falls to pieces after Sabrina sabotages her relationship. Hilda recovers and is married, but Sabrina then falls to pieces when Josh, Harvey, and an attractive waiter announce they are all moving away and will never see her again. At the beginning of the seventh and final season, Sabrina is put back together after her Aunt Zelda sacrifices her adult years to save Sabrina. At this point, Zelda, Hilda, Miles, and Josh are written out of the show and Morgan and Roxie move into Hilda and Zelda's old house. Sabrina gets a job as a writer for the entertainment magazine Scorch, but this storyline and all the associated characters are dropped midway through the season. Sabrina then meets Aaron, the man to whom she becomes engaged. In the series finale Sabrina calls off her wedding with Aaron and runs off with Harvey, her soul mate, at 12:36, which is the time of day they first met and is a plot point in the season one episode As Westbridge Turns. In the last scene of the series, Sabrina and Harvey ride off on his motorcycle to the song ‘Running’ by No Doubt, Sabrina’s favorite band. Melissa Joan Hart as Sabrina Spellman, a teenager who discovers on her sixteenth birthday that she is a witch and comes from a long line of witches. As she struggles to master her magic, she often wreaks havoc on those around her. Sabrina moved into her college's dormitories at the beginning of the fifth season and then back into her aunts' house after they left for the Other Realm. Caroline Rhea as Hilda Spellman (seasons 1–6, guest season 7), one of the Spellman sisters. Hilda is the less rational and more impulsive one. After giving up violin in the fourth season (she destroyed her violin with dynamite), Hilda purchased a clock shop. Later, after Sabrina moved out of the house, she purchased Bean There, Brewed That, the coffee shop where Sabrina worked, and renamed it Hilda's Coffee House. After her marriage at the end of the sixth season, she moved away with her husband. Hilda returned for the series finale. Her middle name, 'Sucker', is revealed in season 6, although her middle name was Antoinette in season 2. Beth Broderick as Zelda Spellman (seasons 1–6, guest season 7), Sabrina's aunt and Hilda's older sister. Zelda, a scientist and college professor, is the more rational of the two Spellman sisters and is often the voice of reason when Hilda or Sabrina uses magic irresponsibly. At the end of the sixth season she gives up her maturity in order for Sabrina to be changed back to flesh and blood after being turned into stone when she lost her true loves. Sabrina advises a now child Zelda to leave for the other realm with a newly married Hilda, ensuring her that she is okay to live on her own. Zelda makes an appearance as a candle in the last episode to allow Sabrina's mother to attend Sabrina's wedding. Nick Bakay as Salem Saberhagen, a 500-year-old witch turned into a talking cat because of his plans to take over the world. Besides Sabrina herself, he is the only character to remain for the entire seven seasons and in fact appears in every single episode. Nate Richert as Harvey Kinkle (seasons 1–4 and 6–7, cameos in season 5), Sabrina's boyfriend in the first four seasons. He breaks up with her when he finds out she is a witch. Amanda, Sabrina's cousin, tells him about Sabrina getting married and gives him his soul stone. He arrives at the church on his bike as Sabrina is running out. He is revealed to be her soul mate because their soul stones fit together. In the end, Sabrina leaves Aaron at the altar. Then Harvey and Sabrina run off together after they share a final kiss with Sabrina's favorite band, No Doubt, as the closing theme. Jenna Leigh Green as Libby Chessler (seasons 1–3), Sabrina's arch-enemy while at high school. Libby is a spoiled rich girl and is often at the other end of Sabrina's spells as she learns to use them, leading Libby to often call Sabrina a "Freak" or "Freakster". Libby, a cheerleader, is seen to fancy Sabrina's love interest, Harvey, and makes many attempts to ask him out. Libby was sent to boarding school following the end of season 3. Michelle Beaudoin as Jenny Kelley (season 1), Sabrina's best friend at high school in the first season. Jenny befriended Sabrina on her first day, and also introduced Sabrina to Harvey. Jenny walked into the closet at the Spellman house and ended up in the Other Realm, where Sabrina and her aunts had to rescue her and make it out as a dream. Jenny left at the end of season 1 and is mentioned in season 2 by Sabrina. Paul Feig as Mr. Pool (season 1), Sabrina's favorite teacher who teaches Biology during the first season. He was sometimes bitter and sarcastic, but always interesting and usually lively. Mr. Pool is not mentioned after season 1. Lindsay Sloane as Valerie Birkhead (seasons 2–3), Sabrina's best friend from the second season. She comes across as dim but it becomes apparent that she suffers from self-doubt when Sabrina casts a spell on her that backfired—making her overconfident and careless. She discovers that Sabrina is a witch after Sabrina tells her and Harvey on Friday the 13th. Valerie left to move to Alaska with her parents at the start of season 4. Martin Mull as Willard Kraft (seasons 2–4), the head teacher of Westbridge High, Sabrina's high school, and the on/off boyfriend of both Hilda and Zelda. Hilda mentions that herself and Zelda have stopped using magic on Willard, as it is starting to affect his mental state. This is also mentioned at the Jerry Springer Show when Zelda and Willard's ex-wife Lucy (who is a witch, unbeknownst to him) fight for his affections, in an adaption to the lie detector test, they performed the potion detector test showing he had extremely high amounts of magic in his system. The character left the series after season 4. Alimi Ballard as Quizmaster (season 2), also known as Albert, is Sabrina's tutor who helps teach her to use her magic properly to acquire her witch's license. As Sabrina gained her license in the first episode of season 3, the character's last appearance was in the last episode of season 2. David Lascher as Josh Blackhart (seasons 4–6), Sabrina's handsome co-worker in the Coffee Shop and later, love interest. Josh struggles with his career throughout his first two seasons, until he decides he wants to be a photographer. His relationship with Sabrina is much less consistent than that of her and Harvey. They often have problems to overcome. In the end, he leaves for Prague after Sabrina gives up her love life to save Hilda's life. Jon Huertas as Brad Alcerro (season 4), the new kid in school, but used to attend Westbridge High, before Sabrina went to that school. Brad is a witch hunter but doesn't know it. Sabrina tries to stay away from him, but every time she is in school and uses magic, Brad always sees it. In the episode "Dreama, the Mouse", Dreama makes a water fountain appear, Brad sees and says "You know, sometimes I think you're a real witch" and then Dreama turns into a mouse. In that same episode Brad loses his witch hunter gene through an operation. That is when Sabrina realized that he's just a jerk and now she can use magic on him. China Shavers as Dreama (season 4), the new kid in school, who causes a lot of trouble because she uses magic. She later turns out to be Sabrina's student. Sabrina has to teach Dreama how to control her magic. At the end of season 4 or the beginning of season 5, she is not mentioned and we don't know if she passed her test to get her witch's license. Soleil Moon Frye as Roxie King (seasons 5–7), Sabrina's mortal roommate during her college years and remains a very close friend to her after their graduation. An activist with a very cynical humor, her opinion often clashes with Sabrina's more preppy attitude towards life. Later, both seem to have an effect on each other, as Roxie grows to be much more honest and compassionate, while Sabrina matures and becomes more socially conscious. Elisa Donovan as Morgan Cavanaugh (seasons 5–7), Sabrina's third and final housemate, as well as her tutor, during her college years. Morgan is a talented fashion designer and a very good friend, but can also be shallow and even mischievous at times. She's the only known character who dated both of Sabrina's long term romantic interests (Harvey and Josh) as well as expressed interest in her fiancé, Aaron. Trevor Lissauer as Miles Goodman (seasons 5–6), Sabrina's housemate during her college years though, unlike Roxie and Morgan, he's never seen nor mentioned after the graduation. Miles is a goodhearted, but nerdy boy obsessed with all things supernatural. Miles often comes close to discovering Sabrina's secret. Throughout the series, he develops a crush on Zelda, and is hinted to harbor similar feelings for Sabrina and Roxie. During its four-year run on ABC, Sabrina was the highest-rated series among the network's TGIF line-up. In the 2000–2001 season, the show moved to The WB after a negotiation dispute with ABC. While ABC was willing to renew the show for a fifth season, the network was not willing to pay the reported $1.5 million per episode that Viacom Productions, which produced the show, wanted. The WB then picked up the show for a mere $675,000 per episode, but agreed to commit to 66 episodes. When The WB network picked up the series after ABC canceled the series, local stations (usually WB or UPN affiliates, with a couple of "Big 4" network affiliates as well) also picked up the rights to air reruns of the series from September 2000 on a weekday basis after the broadcast syndication ended in summer 2006. For example, WPIX reran weeknights at 5:30pm EST, after reruns of The Fresh Prince of Bel-Air. The series formerly aired reruns on ABC Family, Nick at Nite, The N, Hub Network, and Logo TV. MTV2 also aired the show at one point. It currently airs reruns on Antenna TV. In the United Kingdom, Sabrina previously aired on ITV and Nickelodeon. It began airing on Pop Girl, a free-to-air children's channel, in July 2012, which previously broadcast the first two seasons and the two subsequent movies before shutting down in October 2015. It has aired on The Vault since 2014, and later on 4Music and E4 in 2019. The show can be seen in Ireland on RTÉ Two each weekday, 5:10–5:35 pm, as part of the youth oriented show TRTÉ. The entire series is currently (as of December 2018) available for streaming on hulu. The entire series is available on Amazon Prime. In Australia, the show could be seen on Eleven, the Network Ten (upon which Sabrina originally aired) owned free-to-air channel at 6:00 pm and until 6 December 2013, with repeats at 12.30 am, seven days a week. On June 11, 1999, Knowledge Adventure through Simon & Schuster Interactive and Havas Interactive officially announced the video games Sabrina the Teenage Witch: Spellbound, Sabrina the Teenage Witch: Brat Attack and Sabrina the Teenage Witch: Bundle of Magic for Macintosh and Microsoft Windows operating systems. On March 29, 2001, Knowledge Adventure through Simon & Schuster Interactive and Havas Interactive officially announced the video game Sabrina the Teenage Witch: A Twitch in Time! for the PlayStation game system. An animated spin-off of the show, Sabrina: The Animated Series, started airing during the live action show's 4th season. The role of Sabrina was voiced by Hart's younger sister Emily Hart. Melissa Joan Hart voiced both aunts. This series was followed by a television film, Sabrina: Friends Forever, which in turn was followed by another series titled Sabrina's Secret Life. Neither Emily Hart nor Melissa Joan Hart returned for the television film or the follow up series. A new animated spin-off was produced by Hub Network in 2013 called Sabrina: Secrets of a Teenage Witch. In this version, Sabrina (voiced by Ashley Tisdale) is a witch princess in training so that she can one day rule the other realm. ^ Season 1 and 2 cover exactly a year each, with Sabrina being 16 and 17 respectively. In Season 3 her age is not revealed, but in the Season 4 opening episode she turns 18, implying Season 3 also covers her being 17 as well. Season 4 covers her 18th birthday and that year. Season 5 starts a summer later, with Sabrina being 19 - she spends three years at college in journalism which is covered in Seasons 5 and 6. She has graduated by the beginning of Season 7 (as she's living in the Spellman House with Roxie and Morgan and working), meaning she is aged up to 22 over two seasons covering three in universe years. In the final Season Sabrina is 23. ^ Bianculli, David (April 4, 1996). "'Clarissa' Makes a Bewitching 'Sabrina'". Daily News. New York. Archived from the original on August 15, 2011. Retrieved 2008-12-18. ^ Hall, Sarah (April 21, 2003). "Aniston: They're Real, and They're Spectacular". E! Online. Retrieved 2008-12-18. ^ Gerston, Jill (October 6, 1996). "A 'Normal Kid' With Magical Powers". The New York Times. Retrieved 2008-12-20. ^ David, Bianculli (September 25, 1996). "Witch Sitcom a Brew Ha-Ha". Daily News. New York. Archived from the original on June 29, 2011. Retrieved 2008-12-20. ^ Levesque, John (September 27, 1996). "ABC's new 'Sabrina' could play as 'Bewitched: The Teen-age Years'". Seattle Post-Intelligencer. Retrieved 2008-12-20. ^ Sheldon Bull (writer) (1999-10-01). "Dream A Little Dreama Me". Sabrina the Teenage Witch. Season 4. Episode 2. ABC. ^ Bibler, Frank (July 26, 2002). "Complete TV Ratings 1996–1997". Retrieved February 12, 2010. ^ "The Final Countdown". Entertainment Weekly. May 29, 1998. Retrieved February 12, 2010. ^ "TV Winners & Losers: Numbers Racket A Final Tally Of The Season's Show (from Nielsen Media Research)". GeoCities. June 4, 1999. Archived from the original on February 13, 2008. Retrieved February 12, 2010. ^ "Top TV Shows For 1999-2000 Season". Retrieved February 12, 2010. ^ "The Bitter End". Entertainment Weekly. June 1, 2001. Retrieved February 12, 2010. ^ "How did your favorite show rate?". USA Today. May 28, 2002. Retrieved February 12, 2010. ^ "Rank And File". Entertainment Weekly. June 1, 2003. Retrieved February 12, 2010. ^ Pavan. "ABC Family March 2011, Sabrina the Teenage Witch Leaves; Remembering Peggy Rea". SitcomsOnline.com. ^ "The Hub April 2012 Schedule With Facts of Life, Mork & Mindy; TV Land Brings Back Gunsmoke – SitcomsOnline.com News Blog". Blog.sitcomsonline.com. 2012-03-19. Retrieved 2015-10-28.